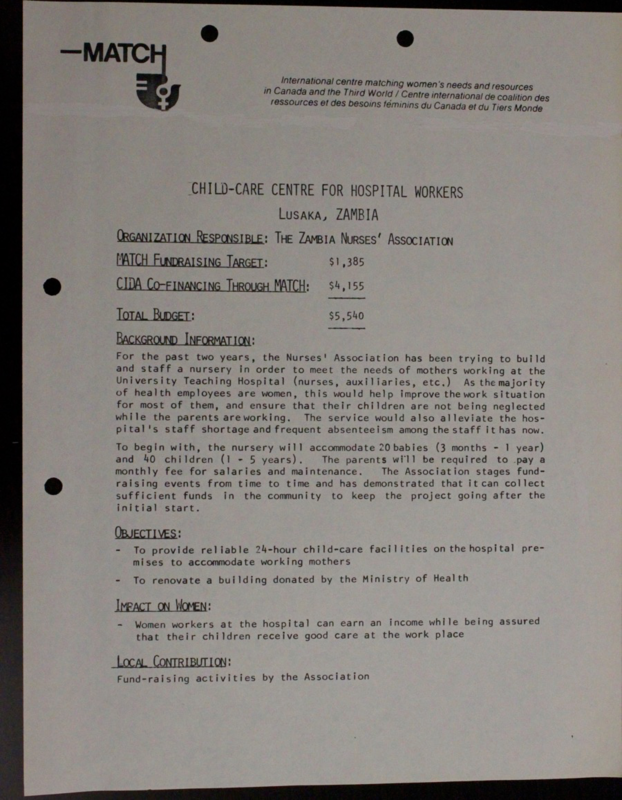 Canadian Network on Humanitarian History » Creche for the Children of Hospital Workers in Lusaka, Zambia, 1980-1981. One particularly interesting project I could understand well was in Zambia. It involved the establishment of a crèche, for working mothers in the capital city, Lusaka. The daycare facility was to be located on the grounds of the University Teaching Hospital for the care of hospital workers’ children while they were on duty. The file includes correspondence on plans for the project and securing funding, collaboration with Canadian University Services Overseas (CUSO), and press clippings on the finished project. For each proposed project that The MATCH Fund (known at the time as “MATCH International”) had undertaken since its creation in 1976, an info sheet was drawn up outlining the objective and expected impact of the project, as well as funding needs and provenance (Figure 1). This particular project had a budget of $5,540 CND, including a grant from the Canadian International Development Agency, with the additional contribution of outside donations and local fundraising efforts in Zambia. Figure 1: Information sheet for MATCH Project 35.Z.5 stating objectives, budget and expected impact. Carleton University, Archives and Research collection, X10-102 Box 5. At the time, most of the nursing staff at the hospital were young women, with growing families of one to eight children. The crèche was to provide a safe childcare environment for the children of hospital staff while they were on duty. The crèche was meant to cater to all women working in the hospital, not just nurses, and to run 24 hours per day to accommodate night staff on duty. The Zambia Nurses’ Association voiced the need for a daycare facility and had been trying to get the project off the ground. In keeping with their mandate to partner with women’s organizations in the global South, The MATCH Fund provided funds and directed assistance to the local group. The organization was named MATCH International because of the mandate, to match “women’s needs and resources in Canada and the Third World”. I found this folder particularly interesting because it includes the blueprint showing the proposed renovations of the building donated by the Zambia Ministry of Health (Figure 2). The crèche would have a nursery, quiet area, store rooms, staff and children’s toilets, office and playground. The file also includes a copy of a list of supplies to be purchased for the crèche, categorized into babies’, toddlers’, and general supplies with estimated costs. The crèche was expected to care for 40 toddlers and 20 babies. Findings like these show the preparation and work involved in implementing such a project. The MATCH International Women’s Fund’s mandate was to improve the lives of women in developing areas to better their ability to contribute to the development process. The provision of safe childcare for hospital workers’ children would presumably improve the operations of the hospital. Being a teaching hospital, the operations could facilitate better education of healthcare workers, with fewer women missing work due to lack of childcare. 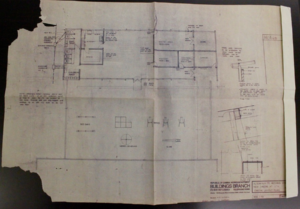 Figure 2: Blueprint for the creche including offices, nursery, and playground. Carleton University, Archives and Records collection, Match project 35.Z.5. X10-102 Box 5. The project was completed in collaboration with CUSO, a Canadian-based international development organization founded 1961. The MATCH Fund has a history of partnering with like-minded organizations, and CUSO emphasized the “vital role of women in the development process”. Co-creator of The MATCH Fund, Suzanne Johnson had worked for CUSO running the Toronto office prior to co-creating The MATCH Fund with Norma Walmsley in 1976. The file does not give any clues as to how long the crèche stayed in operation. The answer may be found in another of the 197 boxes deposited last year at ARC by The MATCH Fund where the cataloguing is under way. In the meantime, the website of The MATCH International Women’s Fund tells a little about their history, on the occasion of the 40th anniversary. For a text on her experience at Carleton, see Kirsten Fenn, “Discovering a Future in Studying the Past”, Carleton Now, June 2015, http://carletonnow.carleton.ca/june-2015/discovering-a-future-in-studying-the-past/ . Victoria’s work was funded by I-CUREUS and by a Development Grant from the Carleton University Research Office, and supervised by Lloyd Keane and Erin Edwards.